Experience the beauty of Kauai’s waterfalls. 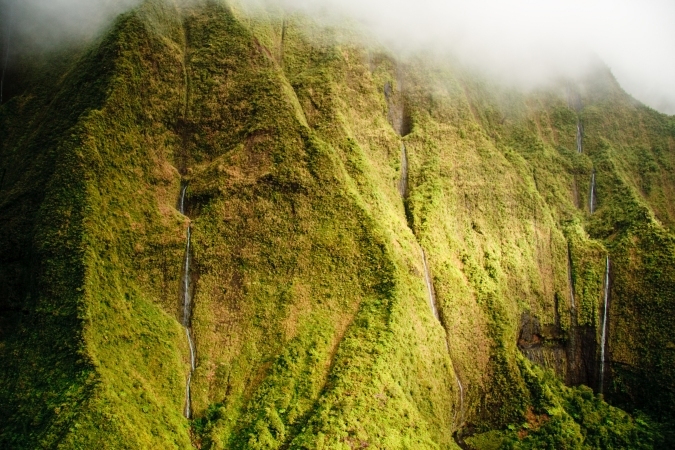 There are plenty of waterfalls on the island of Kauai—many of them undocumented. You may see one on a random hike. Some of them will require a helicopter to see. I will list a handful of my favorites. Wailua Falls-These are possibly the most popular falls on the island. 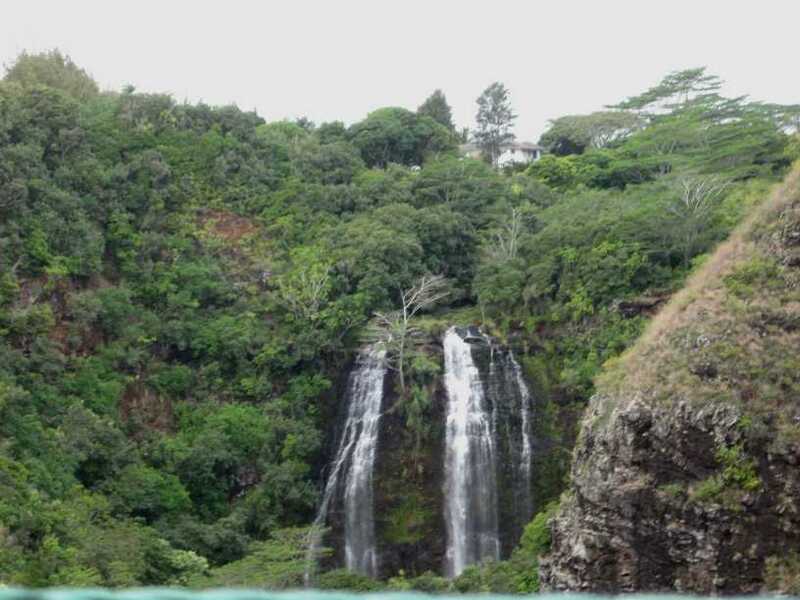 These falls are most famous for the opening scene of the old “Fantasy Island” TV series. If you don’t know what that was, don’t ask. There is a reason why you don’t see that DVD series lining the walls of your local BestBuy. If you are lucky when you visit, you will catch a rainbow over it. 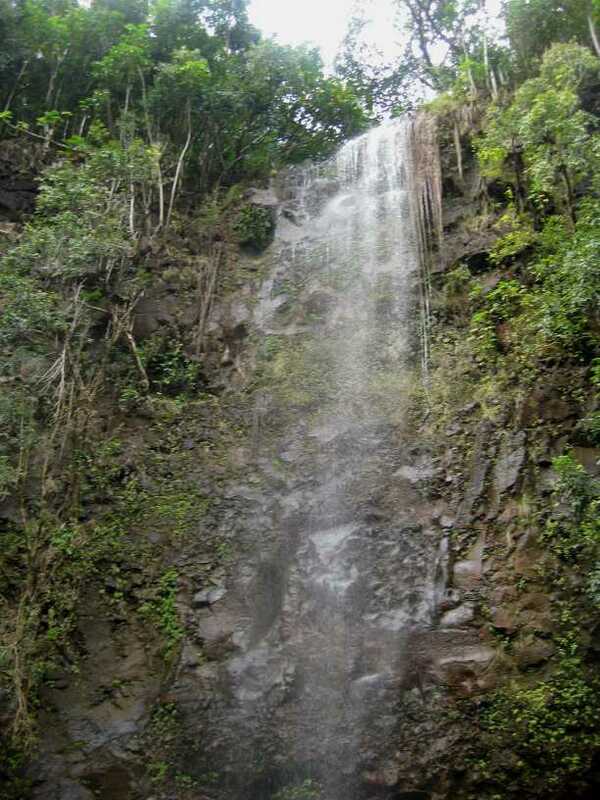 The falls are located within five minutes of Lihu’e. To get to Wailua Falls, take Highway 56 north out of Lihu’e and turn right onto Highway 583 (Ma’alo Road) and drive to the end of the road. 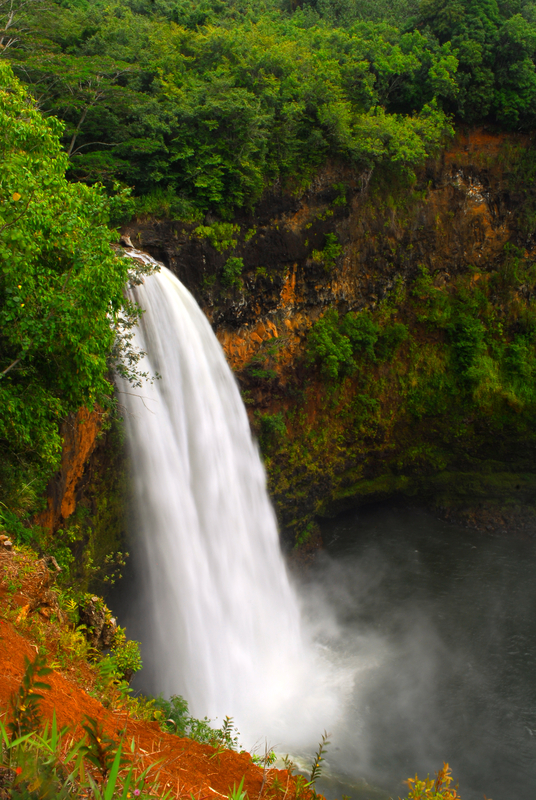 When you go to visit Wailua Falls, you should also plan to take in Opeaka’a Falls too because of their close proximity. Opeaka’a Falls-These falls are quite popular because not only are they beautiful, but you can drive right up to them. They are also quite reliable. Other falls may grow and fade through the year with the rainfall. These are quite strong all year long. To get to Opeaka’a Falls, drive north on Highway 56 from Lihu’e. Once you cross the Wailua Bridge, turn left onto Kuamo’o Road (mile marker 6). From there, take the road up another mile and a half to the Opaeka’a Falls lookout. Parking is usually tight so the earlier in the day you go, the better. Waialeale Crater Waterfalls-These are spectacular falls that can only be seen by helicopter. If you can afford it, I would highly recommend a helicopter tour. When you see the falls, you will be struck with the thought, “gee, those look just like the falls in such and such movie” and you will probably be right. They get used a lot in the movies with tropical island settings. Hanakapi’ai Falls-These falls are triple-tiered, falling 30 feet. If you want to hike to some falls, these would be the falls to hike to, but only when the weather is cooperating. Hanakapi’ai Falls branches off from the Kalalau trail and both are treacherous when wet. To get there, you hike two miles in on the Kalalau trail (the trailhead can be found at Ke’e beach). After the first two miles of hiking, you will reach Hanakapi’ai Beach which is a beautiful beach to spend some time at. You might expect it to be secluded but every time I have been there, I was never alone. After your break, you will hike inland for two more miles. These next two miles are more strenuous than your first two and require finer navigational skills as you are hiking through thick jungle terrain. The hike may tax you, but the reward is well worth it. The full round trip distance you will cover is 8 miles and you should plan on 6 to 8 hours for the full hike. Like all the other hikes on Kauai, take more water than you think you will need. Secret Falls-These falls (Hawaiian name is Uluwehi) are anything but secret. They are quite popular and with reason. Good luck taking a picture of your party at Secret Falls without extra heads and bodies in the background. From sun up to sundown, there is a constant stream of visitors to this distant but busy spot. The most common way to visit it is via kayak. On your first visit, you should take a guided kayak tour to learn the ropes. But after that, you should be fine on your own. If you choose to venture out on your own the first time, just follow the groups of folks kayaking up the river. Most guides on the tours are quite helpful and knowledgeable. Not only will you learn the proper etiquette for kayaking up the Wailua River, but you should also learn about the history of the area and interesting facts about the plant life and the river itself. There is also a stream crossing which can be dicey if the water is high. There is a rope to help you cross, but is not always enough if you are deep in strong currents. To get to Secret Falls, you paddle up the Wailua River about 2 miles to the spot where you drag your kayak onto the beach with 60 of its closest friends. Your best bet is to take the 7 am tour and get in ahead of the rush. We happened to go one day after the tours had been shut down for a couple of days due to heavy rain and the river was packed. You could walk across the river on the tops of kayaks, but as always, it was worth it. We went on a guided tour and our guide was very skilled at taking a picture of the family and excluding the twenty other families frolicking in the background. To this day, I look at that picture in amazement seeing how secluded the falls appear in the picture, but knowing how many people were there with us.